Western PaddleSports offer a complete range of Flat Water Courses, offering everything from Introduction to Paddling, through to Personal Tuition. Please use the links below to view our extensive range of Flat Water Courses. Paddling can be a wonderful pastime, but a difficult sport in which to get started if you tackle it without proper training and technique. It offers the most wonderful level of recreation, combined with a lifetime of potential for learning and personal development, and as you learn, so the opportunities for your activity grow. We have helped clients numbering into the thousands now to get started in paddling, and we regard it as one of the most important parts of our focus. If you get a good start, you are much more likely to go on and become a successful participant. Before you spend any money on lessons or equipment, do our Introduction to Paddling course and first answer the most basic question – is paddling for me? If your response is positive, the next step is to develop some basic paddling skills. Our recommendation is to do the Initial Paddling Skills course and learn the basics properly. Then do some practice. Come along if you can and take advantage of our free Tuesday evening sessions, try out different boats, and see what you like. Now you have enough of an idea of what you are doing to approach various sales outlets and see if they have a craft that suits you. Take your time; try different boats before you buy. And when you find what you want, you are now started with your first boat and a set of basic paddling skills that will let you develop your knowledge and enjoyment of the sport in a safe and satisfying manner. Follow these simple steps and you are much less likely to finish up with a “dust gatherer” in your garage because you rushed out and bought a boat without any idea of what you were doing. We can assure you paddling will be a real joy and a pleasure for years to come. All paddling begins with developing the necessary skills on flatwater, and then progressing to whatever craft and environment you may wish to tackle beyond that. Please choose from our wide range of courses below to the level of tuition that will assist you to achieve your goals. This very enjoyable half-day course is ideal for those who want to try paddling to find out if they like the activity before investing in tuition or equipment etc. On sheltered flat water in a series of easy lessons we will teach you the basics of how to use items of paddling equipment, safe entry and exit of your craft, forward paddling, some easy turning strokes, and essential balance and safety skills. All equipment provided. 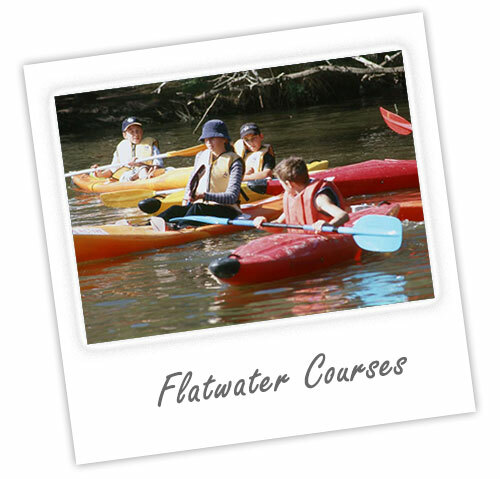 The emphasis is on an enjoyable paddling experience using easy to paddle craft rather than detailed tuition. For those who want the necessary skills for safe paddling, this full day course is our most popular paddling course. It provides a comprehensive set of basic paddling skills suited to paddling any type of kayak. Whether you plan to do easy touring, tackle the Avon Descent, or go on to learn advanced skills such as whitewater or sea kayaking, this is the place to start. In a series of structured lessons we will teach you the essential skills of using the equipment, the correct method of forward paddling with emphasis on avoiding strain injuries, many useful turning and support strokes, and a range of self and mutual rescue and safety skills. The course is an enjoyable and demanding day that will set you up with the foundation skills for whatever type of paddling you plan to do in the future. Equipment is supplied and courses are run regularly each month. Our Advanced Skills course is for those who have completed the Initial Skills course, and now want to learn the more technical strokes and skills required for paddling shorter kayaks typically used in whitewater. The course is a flat water course, and is normally undertaken by those who own suitable craft, although we can supply equipment if required. In it, we cover the more technical kayak skills, stroke combinations and advanced bracing skills that are the essential skills of the whitewater paddler. This course should be completed before going on to undertake the Introduction to Whitewater course. These regular half day courses are for those who have purchased a Ski. It is particularly aimed at users of plastic CTR and racing ski’s who want a sound technique and a good set of basic paddling skills. Our bracing and rolling course is designed to meet the needs of different groups of paddlers, and is typically customised to suit their needs. It is suitable for those who have been paddling for some time, and want to improve on or add these skills. It is suited to those who have completed either courses 2 or 3 above, and now want to learn to roll. In a morning or afternoon session, we will ensure you have sound bracing skills and have grasped the fundamentals of rolling to enable you to practice these skills following the course. River or pool sessions arranged according to the season. We are often requested to provide personalised tuition and assessment by paddlers seeking to learn or improve a particular aspect of their paddling or adapt the skills they have to a particular type of paddle craft. We are happy to provide individual sessions tailored to your needs. Any client who has completed any of our flatwater courses or more advanced training is also welcome to join our weekly paddling sessions Free of charge. Our usual meeting is on Tuesday evenings at Peppermint Grove (where the majority of our flatwater courses are conducted), starting around 4.30 pm and finishing by 7.00 pm. This is an excellent opportunity to try different craft, practice the skills you have been taught, or enjoy a paddle on some of the very scenic sections of the Swan River. We don’t run classes on Tuesday evenings, but our instructors are more than happy to look at how your skills are progressing and provide useful feedback. We bring a trailer load of craft and you are welcome to paddle any boat that suits you, or bring along your own boat. If you are planning to come along, we suggest you call or email us before close of business on a Monday to confirm that we will be in attendance.